My sister is dying . . . I just came back from spending two days with my sister who is in hospice. I was in awe and greatly saddened by her situation. One is always saddened by the imminent death of a loved one, but more when others take it upon themselves to accelerate a person’s passing. When I arrived, I was expecting to see my sister in a weakened state because of her illness. What I did not expect was to see that her feeding tube, hydration and antibiotics had been removed. I quickly asked why this had been done and was told that the doctors had informed her husband that there was nothing else that they could do to preserve her life. Unfortunately, her husband, who seems not to understand the concept of “death with dignity” authorized the removal of life support systems that are ordinary: water, food, and medication. After serious attempts to reason with him about the immorality of this choice, I found that I was talking to myself. When I inquired about the legal way to get around this, I found out that the state considers such measures extraordinary and that the next of kin or the guardian appointed by the patient has the legal authority to authorize the removal of feeding tubes, water and medication. There is no legal recourse. We live in a society that has clouded the judgment concerning the dignity of life and the dignity of the terminally ill and redefined “death with dignity.” One no longer dies with the dignity of sons and daughters of God. One dies according to an arbitrary definition of dignity that is based on our fear of suffering and our desire not to deal with pain, forgetting all along that suffering and pain are as much a part of life as are joy and pleasure. When I founded the Brothers of Life I never thought that I would be having this discussion and debate within my family; but here I am. The devastating blow of the Culture of Death has permeated every family, from the pagan to the Christian family. Men are no longer consumed with the search for the Will of God, but the search for escape. More than ever do we need men who will protect and stand as prophetic voices that cry out in the wilderness preparing the way of the Lord of Life. As I spoke with my brother-in-law and other family members, I was reminded of the Gospels. It is interesting to note that there is no single story in the Gospel where Jesus allows someone to die, except himself. Even this was not an acceleration of the events. He died at the time and in the manner determined by his Father from all eternity. 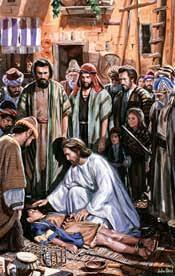 Through the Scriptures we see Jesus raise the dying, healing the sick and calling the dead out of their tombs. This is the image of the Brother of Life. This is the image that was presented to us in Scripture, not only for our brothers, but also for everyon e who believes that we may have life and have it in abundance. It is not our call to accelerate the death of a person, even in the hope of relieving their pain and suffering. Christ calls us to do as he did, to relieve the pain and suffering of the sick and the dying by treating them with dignity and doing all that is within our power to protect their lives. Christ is the eternal Son of the Father. He had the power to heal and to raise the death. We may not have that power, but we have the power of Truth and of prayer. Let us join together to proclaim the Gospel of Life within our families and to the world. Let no man perish because he believes that he is a burden. The only human burden is sin, but Christ relieves us of that burden through contrition and absolution. We’re always praying for you. God bless you.